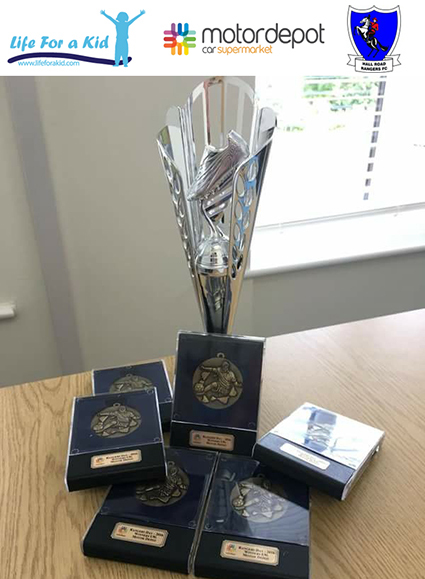 Motordepot are pleased to be able to support Hall Road Rangers "Rangers Day" with the sponsorship of the U9's Tournament Trophies. The event will be held at Hall Road's home ground - Haworth Park on Sunday 31st July and will raise money for Life for a Kid, a local charity Motordepot have supported since 2015. The day will start with a Hall Road Rangers select XI playing host to the Hull City Ex Tigers in the annual Primary Tec trophy. The game itself kicks off at 11am and is sure to be a great encounter. All proceeds from the game will go to Life for a Kid. The game will be followed by a mini tournament where 12 local sides at U8's, U9's & U10's will compete in their respective age groups for trophies and medals. The Under 8's will compete in the Sports Mail On line trophy, the Under 9's will compete in the Motordepot trophy and the Under 10's will compete in the McAusland and Turner trophy. There will be bouncy castles and ice cream vans on site for the kids. Entrance will be by bucket donation only with profits going to Life for a Kid. We are sure the event will be a great day out for the family and help raise valuable funds for Life for a Kid.